No Time,No Software, No Experience,No Skill, No Problem! If you have looking for an intelligent way to day trade the stock market. Join our group of profitable traders. We share our trading plan right before the stock market open. If you like our services, please share with your friends. Thank You.没时间， 没有软件，没有经验，没有技巧.如果你正在寻找一种简单与智能的方式进行股市即日交易。 欢迎加入我们的团体，成为获利的交易者, 我们在股市开市之前分享我们的每日股票交易计划。如果您喜欢我们的服务，请与您的朋友分享。谢谢。SMS Name, HP No, Email to 83180486 and Indicate what service/s you are interested. 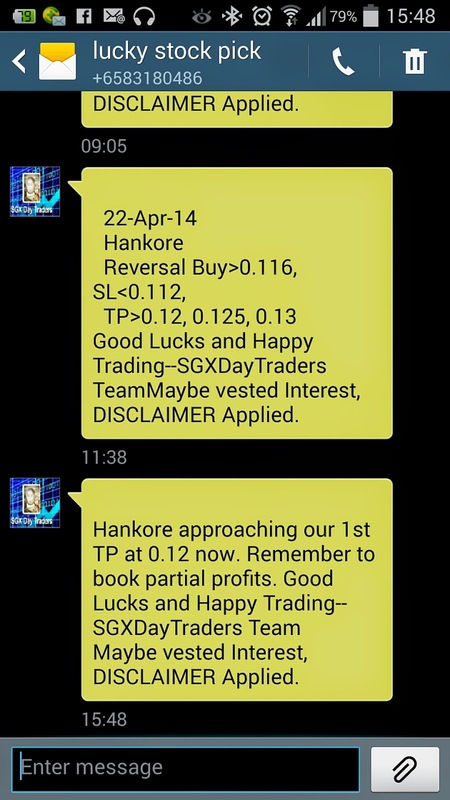 Join our group of profitable traders.欢迎加入我们的团体，成为获利的交易者. We share our trading plan right before the stock market open. 我们在股市开市之前分享我们的每日股票交易计划。 Disclaimer: Stock posting here is for members' education, Not an inducement to trade or promote any insider trading or manipulation. Past results are not necessarily indicative of future results.You should not trade with money that you cannot afford to lose. caveat emptor applies Visit http://sgxdaytraders.blogspot.sg/ for more. What benefits when you join us. We provide FREE Basic Trading lessons to our clients.The strategy taught is simple and yet effective. We meet Clients to review their problem, tailor made course to meet individual need, Coaching and Hands holding till clients can trade independently. Complimentary Facebook "inner circle " group discussion on Chart Analysis and Market News*. Regular group meeting and Market direction analysis. Received paid/complimentary SMS alerts and access to our Daily Stock Pick List for selected clients* T&C Apply. FREE 4 hours Candlesticks Video lessons. Join our Live Trading Webinar and see our Full Time traders' Screen and Ask questions for immediate answer.". Open a FREE Trading Account and Get Sponsored for SGX Day Traders' Services now! Pls provide Name & HP No. Receive SGX Day Traders Updates by Email. 2014 Aug 08-- #sgxdaytraders view on STI outlook for now and near futures! 2014Jul24-- #sgxdaytraders Spotted SMRT a potential Bullish after rebounded from Bottom channel. The Uptrend still intact. 2014 Apr 07 SGX Day Traders Spotted YZJ potential Inverse Head And Shoulders pattern. 2014 Jun 19-- #sgxdaytraders Spotted Centurion a Bullish Setup. 2014Jun12-- #sgxdaytraders Spotted TigerAir a potential Bullish Breakouts. 2014 Jun 20-- #sgxdaytraders Spotted Gallant Venture a potential Bullish reversal Setup. 2014 May 29-- #sgxdaytraders Spotted Oxley a potential Double Bottom support reversal Buy. Triyard Weekly Chart Bullish setup. 2014 Apr 02 - Mermaid Success Contra Trade. We do not guarantee the performance of the techniques explained. Individual results will vary. Trading involves risk. Consult with your professional advisor prior to trading. It should not be assumed that the methods, techniques, or indicators presented in these products will be profitable or that they will not result in losses. There is no assurance that the strategies and methods presented will be successful for you. Past results are not necessarily indicative of future results. You should not trade with money that you cannot afford to lose. Examples presented in these techniques are for educational purposes only. These setups are not solicitations of any order to buy or sell. The presenters, authors, the publisher, and all affiliates assume no responsibility for your trading results. There is a high degree of risk in trading. Techniques taught do not take into account individual financial objectives, situations or needs and individuals should assess any particular investment decision by reference to their own circumstances and financial capacity, including by consultation with a licensed securities adviser where appropriate to their circumstances. Investments in securities are speculative in nature and carry the risk of loss as well as profit.